This is one of the essays I delivered to my patrons this month. If you want to support more work like this, and see it earlier, you can sign up here. I saw Captain America: Civil War this weekend, like so many other geeks. Unlike most of those geeks, however, I had to watch Captain America: Winter Soldier and Avengers: Age of Ultron also this weekend so Civil War would make sense. That doesn’t indicate a lack of interest, just the weird way I consume media. Given my interest, I was paying attention to the Team Cap versus Team Iron Man chatter happening before the movie was released. Everyone I saw was Team Cap, but that isn’t really surprising. Not only is this a Captain America movie, but that’s the way Tony Stark’s character works. He’s not supposed to get things right, at least at first. He’s supposed to drive the plot by getting things wrong. So I expected I would probably end up Team Cap as well. Having seen the movie, though, I’m not. I’m not Team Iron Man either. I’m Team Black Widow. One of the things that I liked about Civil War is that the central conflict was properly tragic. Both Steve and Tony’s respective positions were overdetermined, as was their conflict with each other. Nothing hinged entirely on their philosophical positions. Steve wanted Bucky back and knew that put him in conflict with the forces of law and order. Tony wanted Pepper back and hoped that aligning with law and order would make that possible. All the history around Tony’s parents put everyone’s backs up when they had any opportunity for compromise. Tony needs someone else to make the decisions for a while. It’s supposed to be Captain America in charge on Avengers missions, but Tony’s scientific expertise means he has to keep making decisions. They keep going badly for someone, and the responsibility keeps piling up in ways he can’t handle. He thinks handing authority to someone else will keep him from having to make those decisions. When he finds out he’s wrong, he takes that authority back. Both men have been hurt. Both men trusted people in the past not fully worthy of their trust. Both men made their decisions in reaction to those betrayals of trust. I have sympathy for both of them, but I don’t identify with either of them. Natasha signs up under the accords because they’re going to be signed, and they’re going to be enforced. She doesn’t try to persuade herself that they’re good or that she’ll never be in conflict with them because she’s agreeing to them. She said her piece on that score in Winter Soldier. If people didn’t listen then, she’s not going to spend more energy on trying to make them listen now. She doesn’t spend much of her time or energy on working to persuade the people who don’t want to sign up either. She has her say there, then she’s done. She doesn’t disagree with her friends about whether the accords are good. She disagrees on the best course of action for dealing with them. This is not a friendship dealbreaker. On the other hand, she’s not going to enforce the accords either, not at any cost to her and her friends on either side. She joins the fight, but she’s barely in it. When it becomes obvious that her friends will keep fighting, and that they’re fighting for more than principle, she breaks the accord. And unlike Steve, she doesn’t meekly submit to “justice” afterward. She disappears instead. There are other approaches to the accords among the characters. Clint retires to avoid them but can’t stay out of the fight any more than he can stop remodeling his house. T’Challa and Vision agree with the accords, though Vision obeys them where T’Challa leans on his diplomatic immunity. Rhodey and Sam are following orders and done following orders respectively, and Sam is looking out for Steve. Bucky has other things to do, though he takes action far more effective than the accords. Scott and Peter are just happy to be here. Interestingly, Wanda and Sharon have the arcs most like Natasha’s. Wanda won’t sign up, but she doesn’t put energy into fighting the accords or Tony’s orders until the conflict starts in earnest. Then she commits. No one has asked Sharon what she thinks of the accords, so she doesn’t, but she too goes all in against them when they conflict with her people and her job as she sees it. In the hands of a lesser team or with lesser characters, the fact that all three main female characters react similarly to the accords would read like essentialism. These writers have earned enough of my trust that it feels more deliberate than that. Wanda and Sharon weren’t raised to be assassins, but they don’t have to be to know no one is listening. They just have to be women. The effect is less pronounced, but it’s the same. Treasure the people who listen to you, but move on when they don’t. I personally have a policy that if I’m interrupted three times trying to say something, it just doesn’t get said. That isn’t the same thing as capitulation, though. If there’s one thing the women in this movie teach you (aside from the fact that there need to be more of them), let it be that you shouldn’t trust the silent ones. They will take everything you thought you had locked down and put it back up in the air. You just won’t see it coming, because you never stopped to find out where they really stood, or you didn’t believe them when they told you. The resolution of Captain America: Civil War depends on women whose loyalty was assumed. It depends on women who should never have been trusted because there was never any question what they would do when they had the chance. Wanda never agreed to oversight. Sharon never stopped facilitating Steve’s missions. Natasha said outright that she was signing up because being closer to the official power behind the accords–being trusted–gave her more power to change a bad deal. But nobody listened. You don’t have to listen to me when you’re making decisions that affect me. In fact, I rather expect that you won’t. I won’t insist. I’ll just warn you what comes next, once, without any expectation that you’ll listen to that either. Then I’ll do what needs doing, applying my judgment and skills without your input, since you didn’t take mine. You’ll never see it coming, though it was there all along. That’s Team Black Widow. Not capricious or disloyal, just quiet and determined and patient. That’s my team. *While I understand this reading of Steve’s position, I disagree with it for two reasons. The first is that this is a world with Hydra in it, which both changes its ability to be a direct proxy for our world and makes it more than reasonable for Steve to have developed trust issues. The other is that I don’t read Steve as being unwilling to submit to the consequences of his outlawry until the end of the movie, when we’ve seen that those consequences aren’t acceptable to any of the enhanced humans. Unfortunately, this reading of the film is supported by the filmmakers’ decision to make the only (presumably) good politician or bureaucrat in the movie a dead one. That was cheap and unnecessary, and it undercut the movie’s moral ambiguities. Want to see more work like this? Support me on Patreon. 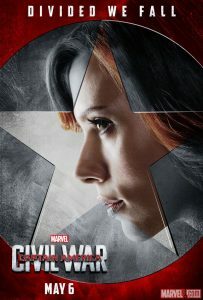 I thought Black Widow did exactly the right thing – she tried it out. She tested the waters. It kept her on the right side of the law for long enough to determine whether or not the accords were going to be fair and just or yet another corrupted bureaucracy, and it put her in a better position to know what she was up against when she made her move. I do think Steve (if they were being true to his character from earlier movies) should have gone the same way. He should have tried – he should have welcomed the idea of competent oversight comprised of all the world’s governments, and he should have at the very least sat at the table and discussed what it would entail before walking away. I know Hydra exists, but Steve is supposed to be an idealist first. It bothered me that he went right to “I follow my own conscience” without even hearing out what government representatives (some of whose people his team had just killed no less) had to say about how he should operate in their countries. I guess that makes for a boring part in the movie though.